Deceptively simple in appearance, a Graham Audio enclosure hides a surprising amount of sophisication. The cabinet features unusually thin walls - just 9mm in the case of the LS5/9 and LS3/5, and 12mm for the large LS5/8. 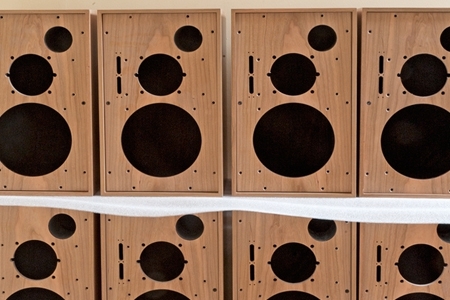 Mass-market loudspeaker designs typically use double those thicknesses, and the idea of thin cabinet walls might appear to be rather counter-intuitive at first glance. How can it work? The "thin-wall" principle was devised by the BBC's Research and Development department in response to a need for lighter cabinets that could be safely handled in a busy broadcast centre, and also for more portable units for outside broadcasts use. During an extensive programme of investigation, it was discovered that compared to the conventional "thick wall" approach, a cabinet made from thin walls plus a layer of bitumen-loaded felt applied to each of the panels of the enclosure brought about unexpected performance benefits. The biggest improvement is in the critical mid range. Each panel of a cabinet will resonate at certain frequencies, contributing in some way to the sound heard by the listener. Rigid cabinets will do so at mid-range frequencies where we are especially sensitive to colouration, even at very low levels, and no amount of stiffening will completely eliminate the problem. Rather than bracing the cabinet in a vain attempt to eliminate all output, the BBC found that thinner panels resonated at lower frequencies, and with a lower "Q", which cleans up the midrange considerably. The addition of the bituminous layer to each panel improves matters by providing damping. Being flexible, it converts acoustic energy into heat, reducing the output from the panels to a level that is well below the wanted signal emerging from the drive units. Simple, but highly effective! The "BBC thin-wall" concept has been known about for many years now, and the unique midrange purity that only a thin-wall cabinet can provide is widely acknowledged. So why is this approach so rare today? The main reason is cost. Modern production methods favour cabinets made from thick panels - the glue-up process is especially quick and easy for this type of construction. By contrast, a thin wall cabinet requires great skill and attention to detail during assembly. Timber battens are required at each joint to reinforce the construction, and these must have total glue coverage to ensure that no sonic colouration can result from an imperfect interface between the batten and the panels. Today, a modern alternative to bitumen is used that performs the same function while being kinder to the environment and more consistent over time. Size and placement within the enclosure is critical, as is the adhesive used to fix the material in place. BBC-specification thin wall cabinets call for the use of very high quality void-free birch plywood, which today is much more expensive than modern materials like MDF. But it is an essential choice in the design of the cabinet, as it works in conjunction with the panel damping to achieve the correct cabinet behaviour. Compared to a conventional enclosure using thick walls, the BBC enclosure is a highly-tuned assembly that is mercilessly revealing of changes of cabinet materials and construction methods. The air enclosed by the cabinet must be considered. With no additional treatment, standing waves will establish themselves between opposite panels, and these will have a ruinous effect on the sound quality, especially in the mid-range. Most loudspeakers use acoustic foam, but the BBC preferred to use Rockwool slabs for the LS5/8 and LS5/9, held in place by a layer of fabric. This approach is more expensive than foam, both in terms of material costs and time taken during construction, but Rockwool has proven itself to be extremely consistent over many decades. A wide range of hand-selected real wood veneers are applied to all surfaces, including the baffle. The loudspeakers are balanced with the grilles in place, but they can easily removed if required; rather than using Velcro strips, hidden neodymium magnets are used.